Secure Sockets Layer (SSL) and Transport Layer security (TLS ) are protocols that provide secure communications over a computer network or link. They are commonly used in web browsing and email. How to get a digital certificate and understand the different common certificate types. TLS is based on SSL and was developed as a replacement in response to known vulnerabilities in SSLv3. SSL is the term commonly used, and today usually refers to TLS. SSL/TLS provides data encryption, data integrity and authentication. When sending a message between two parties you have two problems that you need to address. How do you know that no one has read the message? How do you know that no one has changed the message? Encrypt it.– This makes the content unreadable so that to anyone viewing the message it is just gibberish. Sign it– This allows the recipient to be confident that it was you who sent the message, and that the message hasn’t been changed. Both of these processes require the use of keys. These keys are simply numbers (128 bit being common) that are then combined with the message using a particular method, commonly known as an algorithm- e.g. RSA, to either encrypt or sign the message. Almost all encryption methods in use today employ public and private keys. These are considered much more secure than the old symmetrical key arrangement. With a symmetrical key, a key is used to encrypt or sign the message, and the same key is used to decrypt the message. This is the same as the keys (door, car keys) we deal with in everyday life. The problem with this type of key arrangement is if you lose the key anyone who finds it can unlock your door. 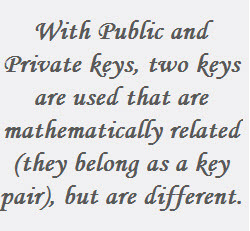 With Public and Private keys, two keys are used that are mathematically related (they belong as a key pair), but are different. This means a message encrypted with a public key cannot be decrypted with the same public key. To decrypt the message you require the private key. If this type of key arrangement were used with your car. Then you could lock the car, and leave the key in the lock as the same key cannot unlock the car. This type of key arrangement is very secure and is used in all modern encryption/signature systems. SSL/TLS use public and private key system for data encryption and data Integrity. Public keys can be made available to anyone, hence the term public. How do you know that a particular public key belongs to the person/entity that it claims. For example, you receive a key claiming to belong to your bank. How do you know that it does belong to your bank? The answer is to use a digital certificate. A certificate serves the same purpose as a passport does in everyday life. A passport established a link between a photo and a person, and that link has been verified by a trusted authority (passport office). A digital certificate provides a convenient way of distributing trusted public encryption keys. You get a digital certificate from a recognized Certificate authority (CA). Just like you get a passport from a passport office. In fact the procedure is very similar. The certificate authority does some checks ( depends on authority), and sends you back the keys enclosed in a certificate. The certificate is signed by the Issuing Certificate authority, and this it what guarantees the keys. Now when someone wants your public keys, you send them the certificate, they verify the signature on the certificate, and if it verifies, then they can trust your keys. To illustrate we will look at a typical web browser and web server connection using SSL. (https). This connection is used on the Internet to send email in Gmail etc and when doing online banking,shopping etc. Server Responds with Server Certificate containing the public key of the web server. Browser uses this Public Key to agree a session key with the server. Web Browser and server encrypt data over the connection using the session key. The difference in the two types is the degree of trust in the certificate which comes with more rigorous validation. The validation process is normally fully automated making them the cheapest form of certificate. They are ideal for use on websites like this site that provides content, and not used for sensitive data. An Extended Validation Certificate (EV) is a certificate used for HTTPS websites and software that proves the legal entity controlling the website or software package. Obtaining an EV certificate requires verification of the requesting entity’s identity by a certificate authority (CA). They are generally more expensive than domain validated certificates as they involve manual validation. Generally a certificate is valid for use on a single fully qualified domain name (FQDN). That is a certificate purchased for use on www.mydomain.com cannot be used on mail..mydomain.com or www.otherdomain.com. However if you need to secure multiple subdomains as well as the main domain name then you can purchase a Wildcard certificate. A wildcard certificate covers all sub domains under a particular domain name. It can not be used to secure both mydomain.com and myotherdomain.com. To cover several different domain names in a single certificate you must purchase a certificate with SAN (Subject Alternative Name). You can also change the domain name covered but would need have the certificate re-issued. It is very easy to create you own SSL certificates and encryption keys using free software tools. These keys and certificates are just as secure as commercial ones, and can in most cases be considered even more secure. Commercial certificates are necessary when you need widespread support for your certificate. This is because support for the major commercial certificate authorities is built into most web browsers and operating systems. If I installed my own self generated certificate on this site when you visited you would see a message like the one below telling you that the site is not trusted. Note: There is no real correlation between the file extension and encoding. That means a .crt file can either be a .der encoded file or .pem encoded file. Question – How do I know if you have a .der or .pem encoded file? Because .pem encoded certificates are ASCII files they can be read using a simple text editor. 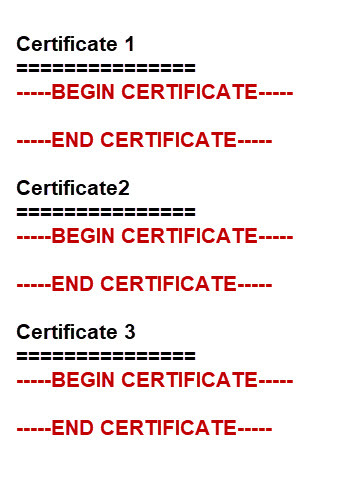 The important thing to note is that they start and end with the Begin Certificate and End Certificate lines. Certificates can be stored in their own file or together in a single file called a bundle. Although root certificates exist as single files they can also be combined into a bundle. On Debian based Linux systems these root certificates are stored in the /etc/ssl/certs folder along with a file called ca-certificates.crt. This file is a bundle of all the root certificates on the system . The certs folder also contains each individual certificate or a symbolic link to the certificate along with a hash. Root Certificates, Intermediate Certificates and Certificate Chains and Bundles. A certificate authority can create subordinate certificate authorities that are responsible for issuing certificates to clients. For a client to verify the authenticity of the certificate it needs to be able to verify the signatures of all the CAs in the chain this means that the client needs access to the certificates of all of the CAs in the chain. 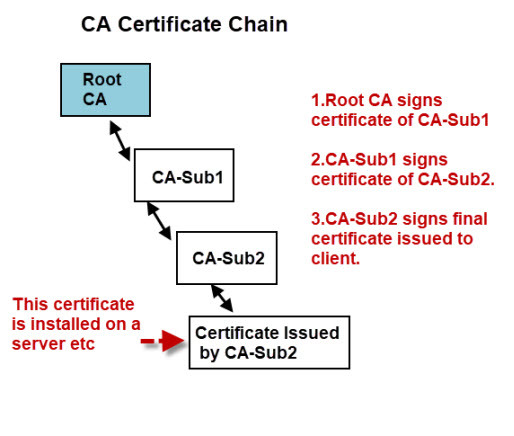 The client may already have the root certificate installed, but probably not the certificates of the intermediate CAs. Therefore certificates are often provided as part of a certificate bundle. This bundle would consist of all of the CA certificates in the chain in a single file, usually called CA-Bundle.crt. If your certificates are sent individually you can create your own bundle by following the steps here. Here is my video that covers the points above. Here is a Microsoft video that I found that explains the above. Q- What is a trusted store? A- It is a list of CA certificates that you trust. All web browsers come with a list of trusted CAs. Q- Can I add my own CA to my browser trusted store? Q- What is a self signed certificate? Q What is a certificate fingerprint? That’s correct the actual encryption uses a symmetrical key. The public and privates keys are to protect the symmetrical key when it is exchanged. Very well explained and concise information. Hi, I want to use the Client Certificate for authentication of my users (>100 users) for a single web application. I tried this implementation with “makecert”, and now I want to purchase it from a CA. I have below questions if you can answer. 1. Which type of certificate I will require? e.g. Single-domain SSL or wildcart SSL? 2. I believe 2 certificates are required i.e. Root CA certificate and Client Certificate from this Root certificate with public and private keys? Am I correct? 3. For 100+ users, will I require a single Client Certificate for all or do I need a Client Certificate for each user separately? If you only want to use it on a single domain then you only need a single domain certificate. If you are purchasing the certificate then the provider will provide the CA certificate. You will need a client certificate per client. I will try to verify the above. You might find these articles of interest, in particular the ibm one. i want to configure mutual TLS between client and server so what are the steps included and how many certificates are required on each side . Only one Ca certificate is required and the client and sever require a server key and certificate. I haven’t tried it yet myself what client are you using? Yes I know. The reason is that the site is several years old and has lots of content. Because of the way WordPress works site links use the full url and so moving to https involves editing all pages to change links. In addition the site only provides information and doesn’t require users to login which makes SSL unnecessary. I do recommend new site owners start with SSL but for existing ones then it can be areal pain to change. This is the best explanation I found yet!!! Very nice article. One small correction about the need for public-private keys. You said about symmetric keys: “The problem with this type of key arrangement is if you lose the key anyone who finds it can unlock your door”. This problem exists for any key, including public key – private key. The real issue with symmetric keys are “key distribution problem”. That is, both the parties have to agree upon a common key at the beginning. But how do you get your copy of the key in the first place ? Does it need another secret key ?.. This is really chicken and egg problem, which is nicely solved by the public – private key arrangement. I agree that smmetrical keys are harder to distribute. The dropping the key analogy is correct as with public/private keys you can lose the public key and not suffer but you couldn’t lose the private key without suffering. Because the keys are the same in symmetical keys if any party loses the key you are in trouble. I also want to use SSL for MacBook Repair Services website and thanks for providing me such a good information. Very useful info and serves as a good guide for beginners. Very informative, simply explained thanks. Thanks for all the information , its really useful. The common name is the name that the broker is running on and that you type into the mqtt client to access it. For Internet connected devices it would be the domain name e.g. broker.mydomain.com. If you use it on a local test network you can usually get away with just calling it broker and not use the domain name. The important thing is that you can reach the broker from another machine using that name. Best explanation of certs ever! Do we really need SSL certificate for every page? I want to get an SSL certificate for my Apple Customer Support website. So please answer my question. You can use an SSL certificate to secure the entire site or just parts of it. To only have it on a page you would re-direct the page from http to https which then forces it to use SSL. As this is off topic a bit for this site if you have any questions use my other site http://www.build-your-website.co.uk. do we really require SSL certificate sites? It depends only on what kind of data is transmitted over communication channel. Are data sensitive which will be transmitting over internet for a page or site, if yes, then you need SSL certificate. When http request is going from client to server or server to client and data is sensitive, then we should use SSL certificate. SSL certificate encrypts the data when it is transmitting. Thanks for this article, really important to me. I was researching onSSL for a while, need it for security purposes for my company. This is one of the most relevant posts I found on it. Encryption is very reliable in performing online data transactions. Easy to follow, helpful article. Thanks! However, is there any more that goes on to explain how private keys are generated in the context of a given public key, and how private keys typically get used ? Public and private keys are generated as a key pair using software like openssl. This tutorial shows you how to create keys and certificates for use on a MQTT server. The private keys are used on the server and need to be kept secured. Very nice and well explained article ! Thanks ! Great article! Very indepth explanation. Thanks a ton! Thank you, very well explained!